For the first time, Hillsong United is uniting with Bethel (Redding’s) Music for a “Night of Worship” on July 21 @ the Redding Civic Auditorium. Note that by their participation, Hillsong is effectively declaring their affinity with Bethel Redding, it’s music, and by default, it’s doctrines. 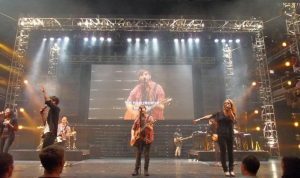 That these two groups should join together is hardly surprising, as both have been at the forefront of the transformation of church music – from the worship of God, to effectively worshiping “worship” music – From music that exalts God, into music that exalts an experiential “encounter” with “the presence”, and which magnifies feelings and emotions.